Spektrum DX7 vs DX6i - What the Heck is the Difference? While the DX7 may have more bells and whistles, the DX6i may be all you really need for your airplanes and flying style. I'm sure you don't want to waste money for features you will never use, at the same time you don't want to buy a radio that you will soon outgrow. Lets take a closer look at the differences between the two systems so you can make an educated decision. If you're short on time just check out this table summarizing the programming differences between the Spektrum DX7 and DX6i radio systems. The DX7 allows you to store up to 20 different model airplanes or helis, where as the DX6i has only a 10 model memory. Both systems allow up to 8 characters for naming each of your models. The Spektrum DX7 has 3 different training modes which are Normal, P-link and Slave/P-link where as the DX6i only has normal. In normal mode the master TX must have the same reverse, travel adjust, dual rates, mixes, sub trims, etc. as the master transmitter. If you're considering buying the DX7 you're probably not a new pilot that needs training anyway. But this is a difference between the two transmitters that's worth noting. Flap mixing allows you to set the elevator and flaps to a predetermined positions for taking off and landing. The DX7 allows for three different such settings, one for normal flying, one for landing, and another setting in between. The DX6 only allows for two settings which are normal flying and landing. The airplane version of the DX7 allows for up to 6 programmable mixes where as the DX6i only gives you two. It's important to note that only 2 of the DX7 mixes allow trim settings to be used on the slave channels. Both of the programmable mixes of the DX6i have the option of allowing the master trim settings to affect the slave's trim settings. The Spektrum DX7 offers more cyclic/collective pitch mixing (CCPM) capabilities than the DX6i. The DX6i will operate 1 servo/90 and 2 servo/120 type swash plates. The DX7 will operate 2 servo/180, 3 servo/120, and 3 servo/90 type swash pates. The DX7 allows you to program 3 throttle curves and 3 collective pitch curves, where as the DX6i has only 2 throttle curves and 3 collective pitch curves. Each throttle and pitch curves for both transmitters have 5 programmable points. The heli version of the DX7 allows for up to 3 programmable mixes and the DX6i only gives you 2 programmable mixes. If you're new to helis and need some more explanation of these features, I strongly suggest checking out this excellent RC helicopter website! I find it helpful to construct a table summarizing the differences between two products when making a big decision. So hopefully the chart below will help you feel more comfortable about your choice. Keep in mind that this table only points out the major differences between programming capabilities of these two transmitters and aren't necessarily the only differences. Another notable difference between the DX7 and the DX6i transmitters is the battery packs. The DX7 uses a typical 1500mah NiMH transmitter battery pack. The DX6i uses 4 "AA" NiMH batteries. Both come with appropriate chargers. This doesn't seem like such a huge deal to me, but it is definitely something you should be aware of. Some people feel that using "AA" instead of a 4-cell pack makes the DX6i feel cheap and toy-like. I personally think it's an advantage because you can always throw in 4 standard "AA" batteries should you forget to charge the night before. A typical 1500mAh transmitter battery should give you around 6 hours of flight time before having to recharge. That's a lot of flying! Spektrum's DX7 transmitter comes with digital servos which means you are definitely getting your money's worth with this system. Have you priced digital servos lately? 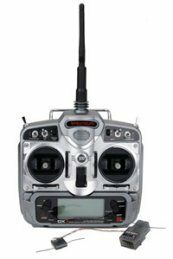 There is a hi-torque version and microlight version of both airplane and helicopter DX7 transmitters. Yes, there are two version of the Spektrum DX7. One for airplanes and one for helis. It's the same radio with the switches in slightly different positions. The throttle comes unratcheted with the heli version, but includes the ratchet should you want to install it. 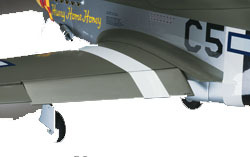 The hi-torque versions of both comes with (4) JR DS821 Digital High Torque Servos with Spektrum's AR7000 receiver suitable for glow powered planes. The microlight versions comes with (3) JR S285 sub-micro digital servos and a Spektrum AR6100 receiver. Only three servos are needed because small electric powered planes or helis use an ESC instead of a servos for throttle control. 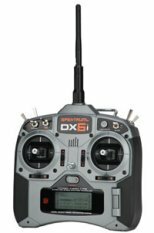 You can buy the DX6i transmitter either with or without an AR6200 DSM2 6-channel receiver, but the DX6i is not available with servos as a package. You have to purchase the servos separately.